There are two competitive pipes when it comes to repiping, Copper and PEX. Both are great, but both also have their pros and cons. At Integrity Repipe, we work with both, but prefer and recommend PEX pipes to our clients. Our reputation proceeds us for our PEX pipe replacement services. Repiping with PEX is best for your residential property. Integrity Repipe is rated number one in the country because we work fast and our services are affordable. With five-star ratings on both Google and Yelp, we make sure that your plumbing is reinstalled professional and property. 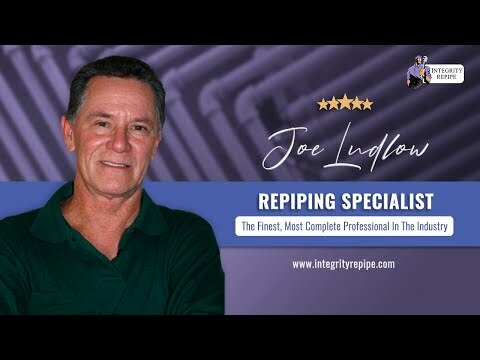 Joe Ludlow, the owner of Integrity Repipe has over 26 years of experience and personally trains his team. There are many pros why PEX plumbing system is the best. Repiping with PEX pipes means a fast installation, it’s inexpensive, it’s flexible, and resistance to scaling and chlorine. Renovating your home can to time consuming and expensive. Having PEX repipe installation will speed up the process and ease the renovation budget. Integrity Repipe technicians are trainees to work clean and organized. Call us to learn more about the pros of a PEX plumbing system. Why PEX better than Copper? The reasons why copper is a very competitive pipe with PEX is because it creates a biostatic atmosphere, which makes it difficult for bacteria to grow. It also resists corrosion and is unaffected by ultraviolet rays. In other words, copper is very resisted. However, the reason PEX is better than copper is that it is inexpensive, requires less labor, needs fewer connections and fittings, and does not heat up like copper. Overall, PEX is the best because it’s affordable, durable, and is fast installation. There are many types of PEX tubing. The best type is Uponor AquaPEX® Tubing. This is the best PEX fitting for repiping a home. The wall thickness, flow path, and internal diameter are outstanding. The chart below compares the features of Uponor F1960 Fitting vs Standard f1807 Fitting. Larger internal diameter of ProPEX means a 25% greater flow rate. ProPEX cold-expansion makes it impossible to overlook a connection, eliminating the problem of blow offs from dry-fit connections. Visual connection of ProPEX also means no calibration is required. Proven for more than 15 years, ProPEX Engineered Plastic (EP) Fittings have a more cost-effective and stable price than metal insert fittings. ProPEX works well in cold weather, especially with the built-in, auto-rotation mechanism on the new Milwaukee® M12™ and M18™ ProPEX Expansion Tools. ProPEX works with the properties of Uponor PEX tubing; clamp, crimp and press fittings fight the tubing’s elastic memory. Built-in auto rotation for effortless, one-handed use, eliminating cold-weather installation concerns. Why do plumbing professionals choose PEX as their preferred system? Copper and CPVC has been used for years. PEX is a plumbing system that is installed quickly, requires little labor and, if someone wants to do a DIY repair, PEX pipe repair is easy. The chart below illustrates the features of all three side by side. To learn more about PEX pipes, contact your local California plumbers, Integrity Repipe Inc.
*PEX-b and PEX-c are not heat-reparable. What is PEX “A” and Should I Use it for My Long Beach Home?